I love my bike! After years of wanting to ride on my own I finally did it. I took my riding course with the intent to ride along with my dad. Now I want to ride all the time and have ventured out on my own. When I ride to work I am ready to tackle anything that comes my way. The energy I get from riding those two wheels is amazing! The weather has turned cold and nasty and I am beginning to go through withdraw! Since this is the first bike I've ridden I really don't have enough experience to say it's the best but the height is perfect for me and the weight isn't overwhelming (yes, I've had to pick it up myself). Even though my young nephews make fun of my "little" bike it's just right for me! If you are thinking about riding as the saying goes "Just Do It" you will not regret it! I just bought an S50. Picked it up 1 week ago today and I LOVE it. All I want to do it ride it all the time. Just started riding. Took courses on a Rebel 250, so when I rode by baby for the first, I was a little intimidated. We are both growing into each other nicely. Turned 50 years old in March and I'm only 5'2". What year is your S50? I am looking at a 2005. I love the look and feel of the S50. I love your bike too! 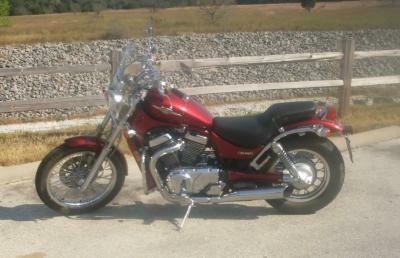 I used to have the predecessor to your bike - an Intruder 800 in gorgeous silver! I loved that bike! I'm really short (4 ft 10 in) so I had to have the seat lowered by an auto upholstery guy. Then it was perfect for me. I wish I hadn't sold it. You're absolutely right, there is no reason not to ride!